PDF Password Remover for Mac is a special tool application for recovering damaged PDF files. This application is specially developed for saving import documents of damaged PDF files. During the recovering process, the application can also directly remove the permission password. So for damaged PDF files, it can recover the PDF files and remove the permission restrictions. ; to good PDF files with permission password, this application can remove the printing, editing, copying or commenting restriction. There are two situations that you may need PDF Password Remover for Mac: your PDF files are protected by permission password, but you forget the password; The PDF files are damaged and you cannot open them to view the contents. PDF Password Remover for Mac is free for trial, and you can download and install it for free. The application interface is as shown in the following screenshot. You can follow the instructions below to recover your damaged PDF files or remove the permission password. Add damaged PDF files to the application. Click Add File and load the PDF files to the process queue under the buttons. Buttons Remove and Clear are for removing unwanted items in the queue. Set a folder to save output PDF files. 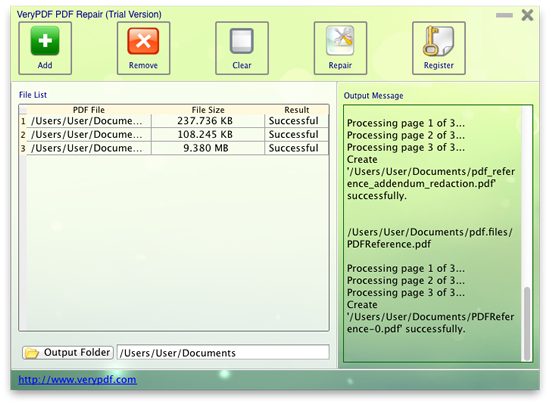 Click Output Folder and choose a folder to save the processed PDF files. Deal with the passwords. During the repairing process, the permission passwords of PDF files will be directly removed and the restricted permissions will be released. To deal with open password encrypted PDF files, please try the Windows version application. Recover damaged PDF files and remove permission passwords. Click Repair and the application will start to recover the PDF files. If the PDF files are with permission passwords, the passwords will be removed in the output PDF files. If you need PDF Password Remover for Mac, you may need to buy a registration code to register the application.